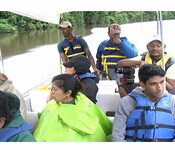 For years the Sarstoon River has been a hotbed for political and military tension. 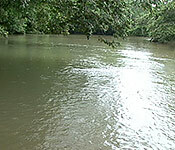 And at the beginning of the month, the southern border between Belize and Guatemala came under threat from a potential environmental disaster. On July 1st, an oil tanker crashed as it was travelling on the Pan American Highway. 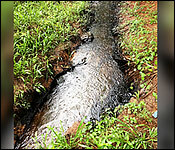 The tanker tipped over, spilling about 4000 gallons of crude oil into the Rio Chacon below. 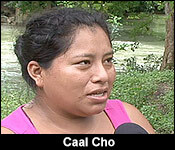 The Rio Chacon feeds directly into the Sarstoon, and then into the Caribbean Sea, which means that if left unchecked, an oil spill could jeopardize the livelihoods of thousands of Belizeans. "This is a wake up call for us, there are thousands of gallons of crude going back and forth within a few hundred feet of the Sarstoon River. You can see the river behind us and you can hear the trucks on the Pan American Highway. There needs to be some kind of put in place to prevent any accidents that should happen. We hope that no accident should happen, but accidents do happen. 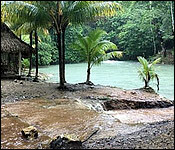 The fact is that this river flows into the Gulf of Honduras. It's an amazing bird life down there. 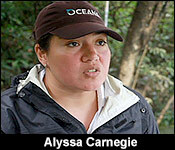 There are amazing fishery down there and of oil should spill into those areas it will affect thousands of people." 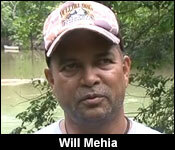 "It is very worrisome, and to be honest the river is very contaminated. They need to be more precautious when drive along the river to ensure that this doesn't happen again." "There is at least seven villages." "I'm not sure but there is a lot. Yes everybody is concerned because the water is contaminated. Right now we can't use the river. Some of us have potable water, but for the ones that use the river, are more concerned." Knowing the possible danger, we headed down South, to see if we could find any evidence of the oil flowing over to the Sarstoon, but our trip to the border wasn't without its challenges. Aside from heavy rainfall, we had a run in with the Guatemalan Armed Forces, who began to follow us as we entered the mouth of the Sarstoon. The GAF soldiers didn't make an attempt to stop us, but they did make their presence known, despite being on the Belize side of the border. We eventually made it Cardenas, the very edge of Belizean territory, and were unable to spot any traces of oil contamination in the water or along the banks. "Yeah, I think if it was going to reach the Belize side it would have been here given the amount of almost 2-3 days now and we haven't seen any on this side. 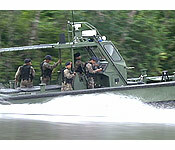 So I think that we are safe to say it won't reach onto the Belize side." While we saw no evidence of oil in the Sarstoon, we may have just been too late. One resident in the area told us that he observed some oil floating down the river about two days earlier. "Right here a friend of mine saw a day ago coming to this part of the river." "How far is it from Belize?" 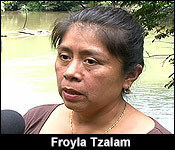 "From the river where it divert into Belize, it's very close." "Has it come into the Sarstoon." "I was speaking with another friend and we are suspecting that it has already reached." "It's going to affect our water, and once it hits the water it's going to affect the fish and all the wildlife that goes with that and it's going to slowly end up in the Gulf of Honduras or the Amatique Bay as we called it here. So I think that even though we didn't see direct physical evidence I think there is going to be a spill out, if I may say that, into the bay and it's going to impact livelihoods. At the end of the day when we are looking at human activity how much is controllable and what are the impact on the environment, I think today is a case in point. The impact may not be direct, but it is going to happen, so I think we need to be mindful of that." "So there are no effects that we can see, but there is a potential of an underlying aftereffect that could affect us." "Definitely there is and I think that's the whole perspective we are looking at." Now, post spill, NGOs and other environmentalists say it's time for the government to start thinking ahead, and begin works to ensure that we have a plan of action in place should another, more serious accident like this occur. "I think it's an opportunity for us to look at system and processes that we do have in place in the event that something like that did end up in our waterway. A very important waterway given the time of year and all the rains and the floods. You've seen the currents how fast it can move. There is definitely concern in terms of if that empties out into the bay and thereby affecting a lot more. So there is concern. But I think an occasion like this is an opportunity for all us to take stock and see where we are and ensure that the right processes are put in place and that we have those safeguards." It is important to know that while we didn't see any oil, it is possible that the heavy raining in the area has washed and diluted much of what could have contaminated the water. 1 registered members (elbert), 43 guests, and 8 spiders.